June was a busy busy time for Marissa: 18th birthday, high school graduation, and then a graduation party! 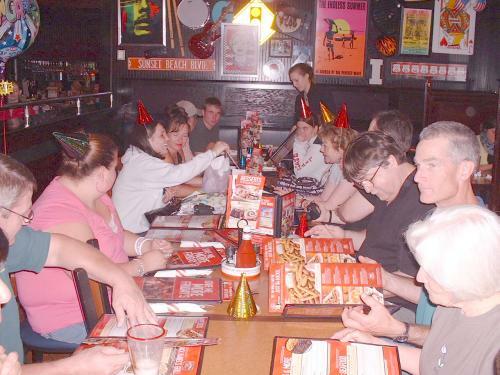 After all of this, life may seem pretty drab... For her birthday, she and a bunch of her friends first got together at Applebee's in Dover for dinner. Then they went down to her mom's for marshmellows over the firepit in the backyard, and ended up the night with a couple of movies and a sleepover for a few. Saturday night, I took her out to eat at her choice of the night: Uno's where we had the best time. We came back and watched the movie The Messengers that I had bought for her. A very well done and pretty scary movie! Of course we had to turn the lights off! We got into it! Sunday she was off to dinner with her grandparents to Warren's in Portsmouth. 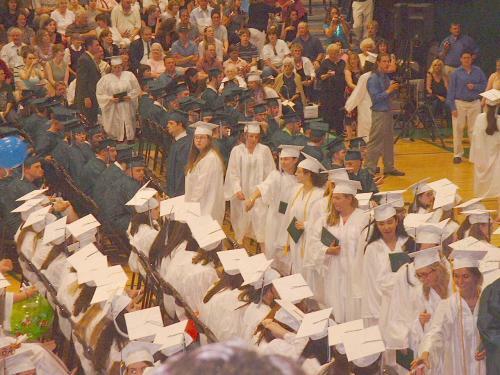 Then she graduated from Dover High School on Tuesday night. 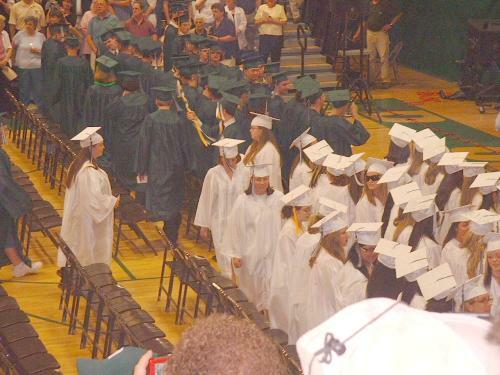 I was so proud of her as she marched up and received her diploma. 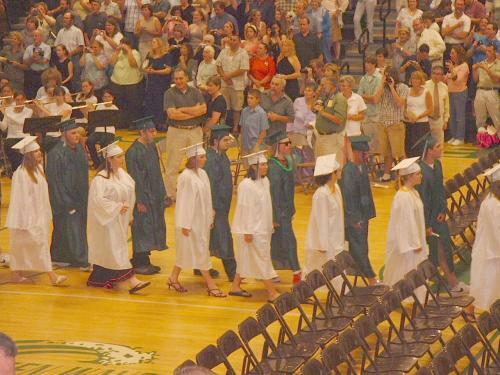 Amazing trivia: this was the 155th graduating class! 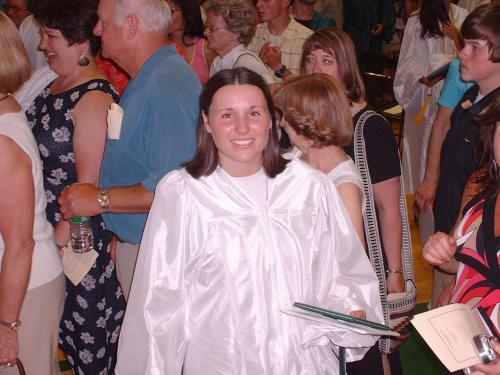 After graduation, she and almost the entire graduating class of 400 went off on an all night school sponsored graduation adventure to a huge entertainment facility with indoor tennis courts, swimming pool, hot tub, games, food, you name it! They all had a ball, but she didn't get home until almost 6:30am Wednesday. She managed to pull herself out of bed by about 1:30pm to get on with the day! 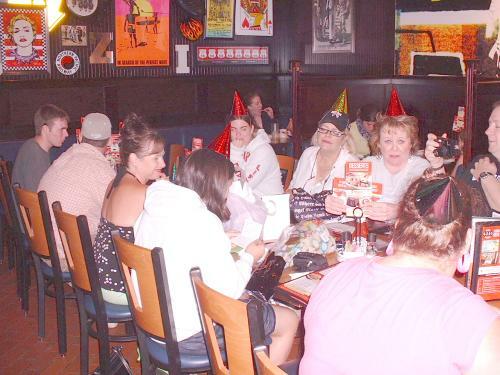 She had Thursday to recover but then on Friday night, Annie - one of her neighboors who is moving - threw her a terrific birthday get together dinner for about 18 people at TGI Friday's in Newington. She was thrilled to see so many of the neighbors there who had watched her grow up celebrate her success. 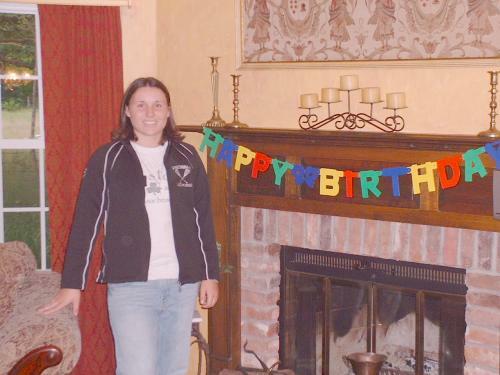 The birthday girl at my place before heading off to dinner. 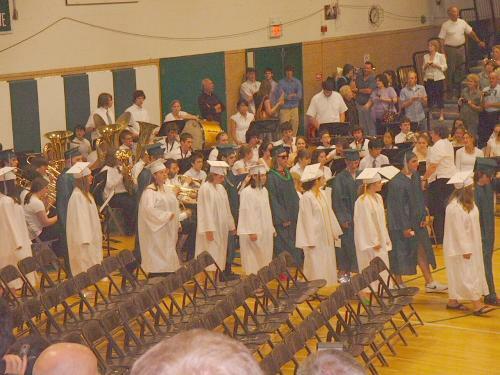 Tuesday June 9th 2007 at 7:00pm and the start ofthe 155th graduating class marching into the auditorium. Marissa, 5th from the left. Marissa, 4th from the left. 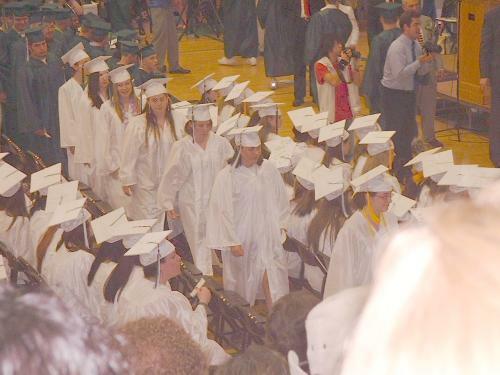 Marissa, 2nd from the end. 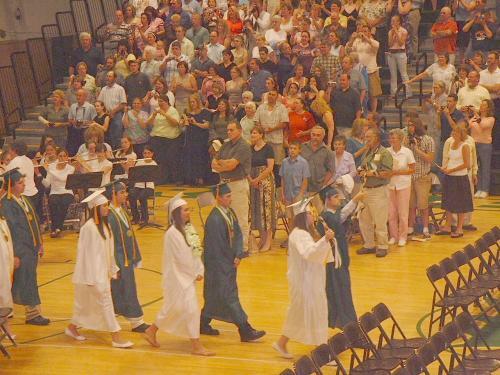 Marissa, 6th in from the left, heading off to get her diploma. It's official! 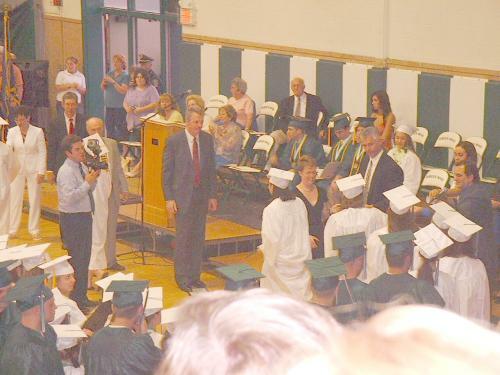 Diploma in hand, she heads for the handshaking line. Heading back to her seat. 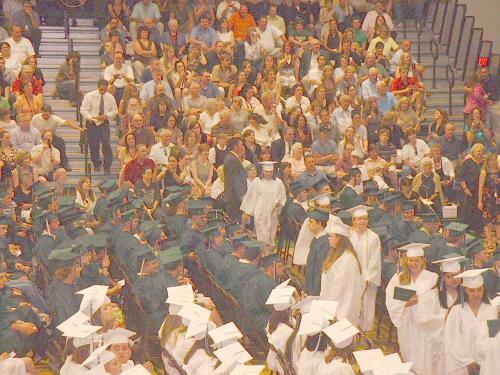 I don't know who she's pointing at, but she must have something witty to say now that she's a graduate! 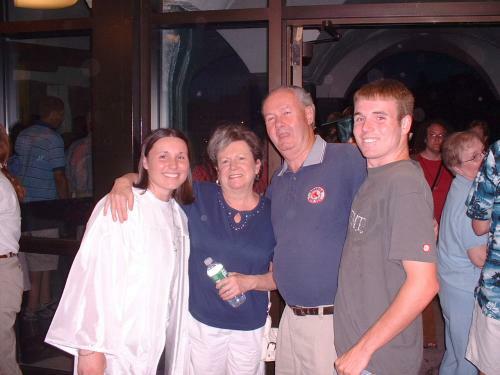 Marissa with her grandparents, Bev and Tom, and her brother Colin. 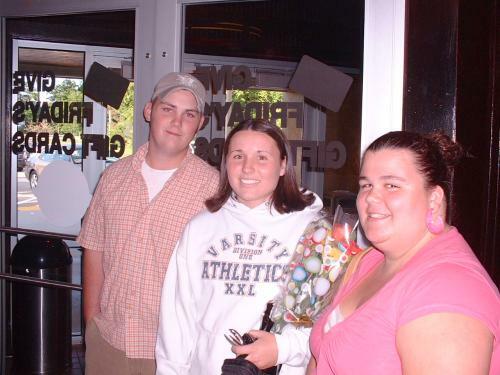 Friday June 15th Marissa proudly holding the flowers I gave her at TGI Friday's in Newington with Gary and Courtney for her party. Annie with Marissa. 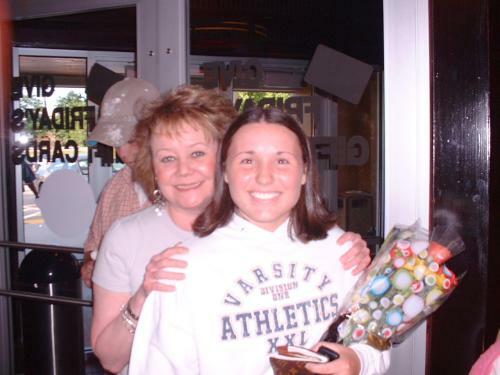 Annie was the one who put the party together for Marissa - and gave her tickets to Justin Timberlake in Boston. A shot of our table. Another group shot of those who came to wish Marissa well.